We’ve just finished recovering from a very busy weekend with a great crowd from New Mini Scotland, who put their cars through their paces on our Dynapack hub dyno. As a hub dyno is not common place in Scotland it was stepping into the unknown for the group who had lots of questions at the start and throughout the day. Once our early runner arrive (who arrived late 😉 ) we set about the business of working through all the cars which were being put to the test. With the hub dyno only giving out power at the hubs there were a lot of puzzled faces until they realised the ‘fudge factor’ to multiply up to flywheel figures hadn’t been added, after this had been added everyone started to understand how things worked and the figures were not far off where they should be, except a few slipping charger belts causing lower figures. 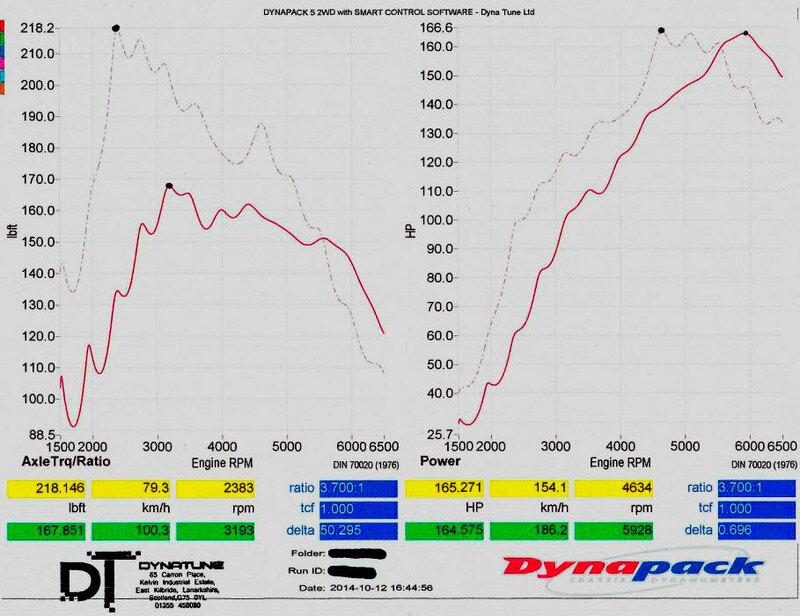 The biggest interest of the day was a couple and their cars, one a John Cooper Works R56 model, the other a brand new F56 Cooper S. With the traction control not completely disengaging you can see on the graphs the engine getting pulled back at certain points. The R56 JCW went first and was a little down on power, the owner putting it down to being overdue a de-coke, then it was onto the F56. The F56 performed flawlessly putting out 165BHP at the hubs, if you go with the conventional 15% front wheel drive transmission loss (fudge factor) that’s 189 bhp, exactly what the brochure says it should have, the biggest surprise was the torque delivery, with maximum torque from 2300RPM this car picks up very quickly from a standing start. We’d just like to say a massive thank you to the members of New Mini Scotland, not only very patient hanging around for all the cars to run but for being a good laugh too. If you own a new Mini or are looking at buying one I suggest you pop over to the forum and ask any questions that you have as they are all a very knowledgeable bunch and should have all the answers you need, not to mention they are a very welcoming bunch.